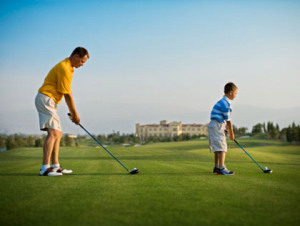 CHARLOTTE TOP TEN GOLF COURSES FOR TOP DADS | South Charlotte Newcomers! Charlotte men and women have long enjoyed the pleasures of a fantastic game of golf on fantastic courses! Charlotte offers many pristine private and public courses for the devoted golfer with nothing but serious intentions and many more casual courses for fun golfing excursions. Top ten courses in the Charlotte area can be divided into public and private courses. South Charlotte offers The Golf Club at Ballantyne as a wonderful public course serving golf enthusiasts of all skill levels. The Golf Club is a favorite PGA, 6,740 yard, par 71, championship course offering a challenging, fair course with water features. The country club setting appeals to those wanting a higher end course. Carolina Lakes Golf Club is a newer addition to the Charlotte public golf scene. The Carolina Lakes is just minutes from the Ballantyne area in the beautiful Sun City Community. The course is a 7,024-yard, par 72-championship course. The course maintains a G2Bent Grass greens and Bermuda fairways and was nominated for Golf Digests Best New courses. Also just minutes from Ballantyne, in the quaint town of Fort Mill is Springfield Golf Club. The 6,906-yard, par 72 public golf course is considered a beautiful course with hills, woods, and streams. Deer Brook Golf Course is a 6,950-yard, par 72 public course in Shelby. Deer Brook is considered well worth the 40-minute drive from Charlotte, with very accommodating staff and excellent greens. Private courses in Charlotte are world renown! From the famous Quail Hollow to the Myers Park Country Club, the Queen City reigns in golf. Quail Hollow, host to the Wells Fargo Championship, is the most well known of Charlotte’s premier private golf courses. Quail Hollow is a 7,114-yard, par 72 course. It is a private equity facility with “ Accompanied By Member” guest policy. Piper Glen Country Club is a private, non-equity course. The beautiful course, designed by Arnold Palmer is a 6,883-yard, par 72 course located in South Charlotte. Myers Park Country Club is a traditional, private country club owned by its members. Myers Park Golf Course features a 7,120-yard, par 71 course. Considered a tight course, there are water hazards in play on five holes. A member must accompany guests. Charlotte Country Club is located in the historic Plaza-Midwood area, just three miles from Uptown Charlotte. The golf course is 7,355yard, par71 Donald Ross course. The course is considered the oldest and most elite of all the private clubs in Charlotte. Founded in 1910 and restored in 2009, the beautiful course remains one of the most sought after memberships in Charlotte. Charlotte’s beautiful weather only compliments the Queen City as the Southern golfers destination! We can’t help but offer Southern Charm on and off the green. This Father’s Day, treat dad to a golfing excursion under Carolina blue skies!